50 • March 2018 • S I G N & D I G I T A L G R A P H I C S DIGITAL PRINTING AND FINISHING DIGITAL GRAPHICS Painting with Pixels Working in the virtual paint studio Stephen Romaniello is an artist and an edu- cator who has been teaching digital art at Pima Community College in Tucson, Arizona, for more than 26 years. He is a certified instructor in Adobe Photoshop and the author of numerous books and articles on the creative use of digital graphics software. Steve is the founder of GlobalEye Systems, a company that offers training and consulting in digital graphics software and creative imaging. B Y S T E P H E N R O M A N I E L L O The Digital Eye Painting Software When it comes to the digital application of color, there are several dedicated painting programs on the market such as Corel's Painter and a host of art-based pixel editors that you will find online like ArtRage, Rebelle 2, and DogWaffle and Krita freeware that all contain features designed to simulate real paintings (see Figure 1). Adobe Photoshop too has a virtual paint studio built right into the interface. The advantage of using Photoshop is that if you have a print shop you probably already own it, and it has many other useful image manipulation features that fit neatly into your workflow. That being said, it's worth downloading the freeware, (because it's free after all!) if you're in the mood to try something new. Painting with Light Painting software uses light instead of physical compounds to render images. 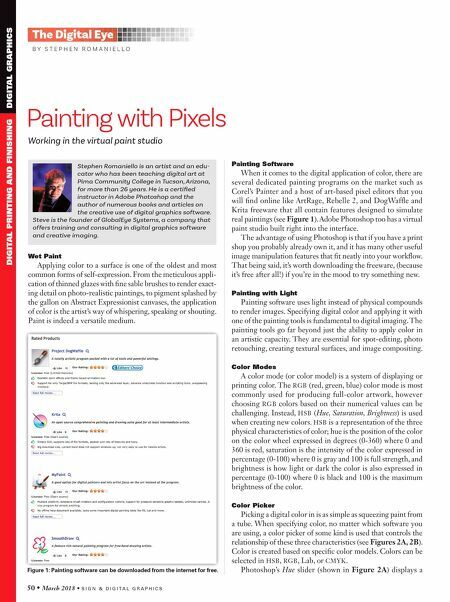 Specifying digital color and applying it with one of the painting tools is fundamental to digital imaging. The painting tools go far beyond just the ability to apply color in an artistic capacity. They are essential for spot-editing, photo retouching, creating textural surfaces, and image compositing. Color Modes A color mode (or color model) is a system of displaying or printing color. The RGB (red, green, blue) color mode is most commonly used for producing full-color artwork, however choosing RGB colors based on their numerical values can be challenging. Instead, HSB (Hue, Saturation, Brightness) is used when creating new colors. HSB is a representation of the three physical characteristics of color; hue is the position of the color on the color wheel expressed in degrees (0-360) where 0 and 360 is red, saturation is the intensity of the color expressed in percentage (0-100) where 0 is gray and 100 is full strength, and brightness is how light or dark the color is also expressed in percentage (0-100) where 0 is black and 100 is the maximum brightness of the color. Color Picker Picking a digital color in is as simple as squeezing paint from a tube. When specifying color, no matter which software you are using, a color picker of some kind is used that controls the relationship of these three characteristics (see Figures 2A, 2B). Color is created based on specific color models. Colors can be selected in HSB, RGB, Lab, or CMYK. 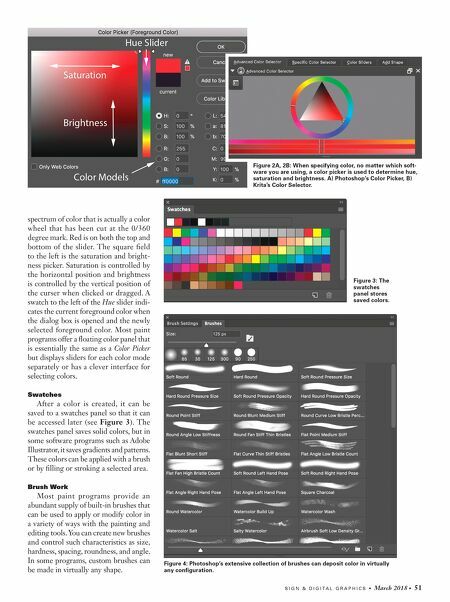 Photoshop's Hue slider (shown in Figure 2A) displays a Wet Paint Applying color to a surface is one of the oldest and most common forms of self-expression. From the meticulous appli- cation of thinned glazes with fine sable brushes to render exact- ing detail on photo-realistic paintings, to pigment splashed by the gallon on Abstract Expressionist canvases, the application of color is the artist's way of whispering, speaking or shouting. Paint is indeed a versatile medium. Figure 1: Painting software can be downloaded from the internet for free.